The Shopping Mall Outside Area Is Move Vibrant! Weevily wow, I was heading on down to the Shopping Mall to buy the brand-new Nestige nest items, when I suddenly noticed it had been updated! It seems as if the Bin’s top builder Rigg, has been working extra hard all week long to construct this for us! In my opinion, I absolutely love what Rigg’s done – the Shopping Mall is now much more vibrant, brighter and of course more environmental friendly! One of the key features in the new Shopping Mall, is the background – I love the idea of being able to see the rest of the Bin areas in the background (for instance, you can see Dosh’s Palace) rather than a plain wall, which we can all admit is pretty boring. It actually (in my opinion) looks like a shopping plaza in a posh place such as New York, with the big Shopping Mall sign on the building and in general, the orange and yellow colours on it. As well as that, I think the magazines stand looks great, I’m sure you’ll all agree with me Bin Weevils’ graphics are getting better and better by the minute. However, many are concerned that Bin Weevils isn’t a “bin” of such anymore – I completely disagree, because bin’s don’t have to be dirty! You imagine a bin as a dirty, grimy place, but actually that’s not the case and Bin Weevils are trying to prove that, by adding grass, flowers and trees around the Binscape to encourage us to support the environment we live in. Figg’s Cafe Has Received A Bin-tastic Update! Weevily wow, I was heading on over to Figg’s Café for a luscious Bin Burger, when I noticed something different.. it had been updated! In my personal opinion, Figg’s Café now looks more fresh and environmental friendly. To show you the difference, we’d first like to show you the old Figg’s Café. We thank Maren for this picture. As you can see, the old Figg’s Café is filled with lots of grime and sludge around the location, which doesn’t make it very inviting. In addition to that, I would also say it’s quite dark – this includes especially includes the trees. To me, they look like a dark forest. However with the new Figg’s Café, I must say the Bin Weevils team have done a FAB job! As you can see, there’s a massive difference! The grass is brighter, everything in general is brighter, there’s more colour to it and there’s no gunk, grime or sludge. I love how they’ve added more flowers to help support the environment. I think having the chairs as blue makes the location more brighter, due to the fact that in the old Figg’s Café, they were plain white and not that interesting. One thing that I especially noticed, is the Figg’s Café logo. It stands out – it’s bright and I like the font also (I might ask Tombalol what the font’s called). In the old Figg’s Café, the logo is plain white (just like the chairs, which is why I say there wasn’t much colour) and in reality, it doesn’t stand out from the crowd. Lastly, Bin Weevil Company would like to know your opinion on the new Figg’s Café. Do you like it? Do you hate it? Let us know in the comments section below! The New Flem Manor Has Hit The Binscape! Haven’t I got Bin-tastic news for you? 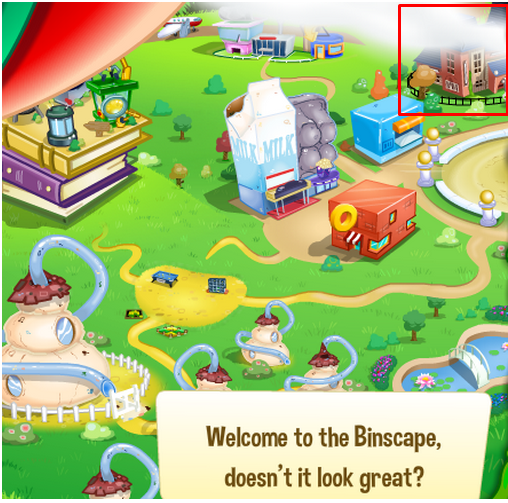 The new Flem Manor has hit the Binscape and believe me, Rigg and the rest of the Bin Weevils team have done an absolutely awesome job – in my opinion, the graphics are fab! This is a bit like when the outside of the Shopping Mall update came – the slime is still there, but just “modernized”. Spot the Differance is now inside Flem Manor, in the room where the art gallery is. We would love to hear your thought on the new Flem Manor, please comment below! Last Monday when the November post was posted, we all saw that there was going to be a new Flem Manor and me and the team couldn’t wait! Well, myself, hf556 (the fabalous owner of this blog) and Eddzy were just creating new Weevils for fun and testing stuff, until we came across a new map update, however you can only see it when you create a Weevil! Oh my Gosh, doesn’t it look amazing! I am quite looking forward to the update and I think the team here at Bin Weevil Company is too. I will be back with another exclusive update soon. 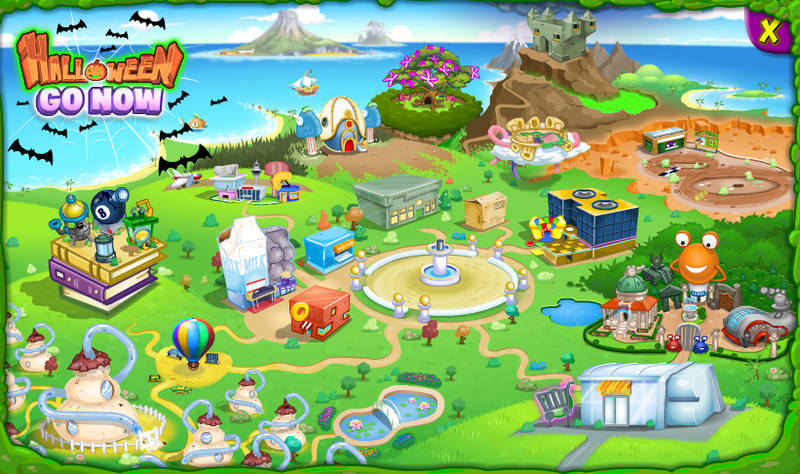 The Brand New Bin Weevils Map Has Arrived! It’s the moment we’ve all been waiting for, weevils! The Bin Tastic brand new map has arrived in the Bin Scape as of early this afternoon, and is just looks amazing. As teased in the ‘Vote for Bin Weevils Trailer’ for the BAFTA Kid’s Vote, weevils far and wide have been drooling over this and waiting for the big arrival. The new map makes Bin Weevils look like it is an island in the sea, rather than like the old map did, looking like floating objects in the sky. Many of the Bin’s landmarks have moved around and been slightly updated because of this. It certainly looks more modern, fresh and inviting. It’s a big thumbs up from me and the rest of the BWC Team, and we’d just like to thank Bin Weevils’ awesome designer, tombalol for designing it. What do you think of it? Love it or hate it? Let us know in the comments down below! New Update To The Outside Of The Shopping Mall! Weevily wow, the brand-new Shopping Mall has arrived and it looks absolutely Bin-tastic! It’s more bright now and much more attractive – a very well done Bin Weevils! A few people were worried that when Bin Weevils started updating places, they would take all the slime away to make it look posh. However, as you can see from the image above, the designers at Bin Weevils have added slime to it, but just upgraded the graphics/quality of it, to make it look more environmental friendly. We would absolutely love to hear your thoughts on this, so feel free to leave a comment below! I’m quite surprised at the moment, as to why the Mulch Tastic machine has strangely vanished from Slam’s Party Box – it’s definitely a Bin mystery for us to try and solve! Do you have any idea why the Mulch Tastic machine was removed? Was it a mistake? Is an update coming? Comment below! Weevily wow, I’ve got another Bin-tastic reason for you to vote for Bin Weevils in the Bafta Kids Awards! Bin Weevils artist, Tombalol, hasn’t stopped this month, he’s just finished designing an awesome Mulch Tastic! Head over to Weevil Post or Slam’s Party Box and click Mulch Tastic. The old Mulch Tastic had really bad and dark graphics and Tombalol has really freshened it up. I really love what Tombalol is doing to the Binscape, I don’t really like how it was all grimy and dark. You shouldn’t really be confused about the new layout, because the layout is exactly the same, the graphics have just been upgraded. I’m sure Tombalol is currently working on the next Bin-tastic update, I can’t wait to find out what it could be! Bin Weevil Company would love to hear your opinion on the new Mulch Tastic, so what are you waiting for? Get commenting!